Let's stay in the 1600s please! 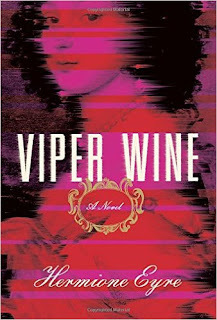 Viper Wine concerns the exploits of Venetia Stanley, one of the great beauties of the 17th century. Five years older than her husband, the explorer and adventurer Kenelm Digby, she was so concerned about growing older and losing her famous looks that she retreats from society. She asks her husband to prepare a tonic for her that will help her to regain her youthful beauty, but he refuses, still seeing her as the beautiful woman he married. She eventually finds someone else to provide her with the Viper Wine potion which will make her beautiful again. As a couple, the Digbys are each immersed in their own worlds and too distracted to really seem a believable pair. This book was very hard to read. I wasn't sure what was happening most of the time. There were elements of time travel and descriptions of things like radio transmissions sort of thrown in here and there (in a book set in the 1630s) that were distracting and annoying. The characters and setting were interesting enough (and based on real events), but I guess the author felt a straightforward narrative wouldn't be challenging enough. The result was a confusing, meandering, mess of a story.